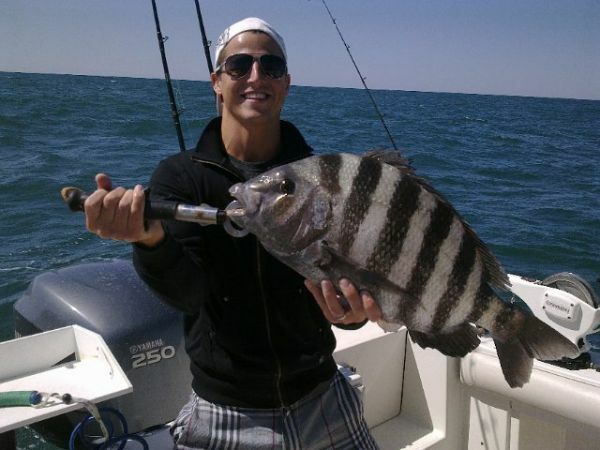 That is because at the reefs there are literary thousands of sea bass (season is closed until June 1), and you have to get pass them before you can get on the legal fish which include: black drum, sheepshead, and weak fish. �You have to give a bunch of �em a sore mouth before you can get to the better fish,� said Capt. Olsen. For this kind of bottom fishing which includes fishing between 30-50 deep depending on the reef, Capt. Olsen is anchoring up and using live bait, shrimp of fiddler crabs, or small jigs. When using live bait, Capt. Olsen uses light spinning tackle spooled with 10-20 pound line. Then he employs a Carolina rig with an 11/2 or 2 ounce egg sinker and a #1 or #2 live bait hook. The jigs are � ounce Red Fish Rigs which he bounces off the bottom or where the fish are suspended. The water temperature at the reefs is between 52 and 55 degrees, and Capt. Olsen is hoping that there will be no more winter because the fishing will only get better as it gets warmer. Contact Capt. Olsen at 843-442-7724 or email at robert@knotatworkfishing.com for more information.